In January 2010, of the 335 lawyers approved to practice before the International Criminal Court (ICC), only 61 were women. A majority of them was European. Since then, the pool of lawyers has diversified, in part due to outreach efforts by the ICC and the International Bar Association (IBA). What is the List of Counsel? Ensuring competent legal representation for all people involved in proceedings at the ICC – including victims, witnesses and defendants – is crucial to the judicial process. The Office of the Registrar maintains a List of Counsel of attorneys who are qualified to practice at the Court. In order to be admitted to the List of Counsel, candidates undergo a rigorous application process. They must prove competence in international or criminal law, have 10 years of experience, fluency in one of the working languages of the Court (French or English) and have no serious criminal conviction or disciplinary offence. In January 2010, only 61 of 335 (18%) lawyers authorised to practice before the Court were women. That number has increased over the past few years. 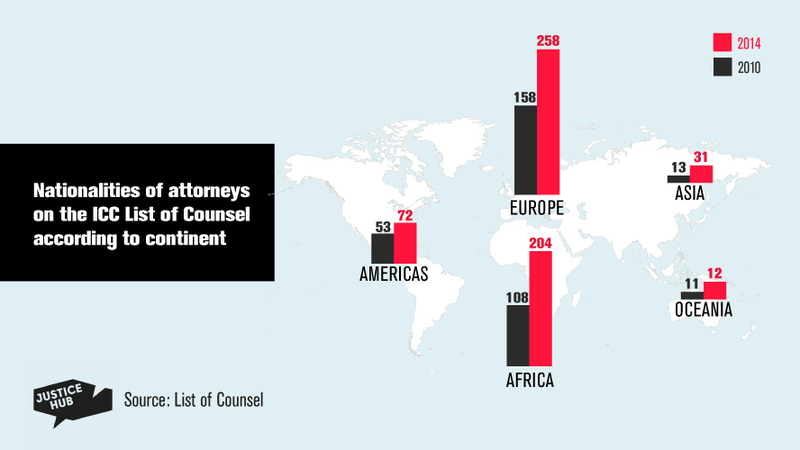 As of December 2014, 141 women were on the list or 25% of the 558 total qualified ICC lawyers. Qualified African lawyers in 2010 accounted for 31% of the List of Counsel. In 2014 that number rose to 35 percent. The increased diversity is due in part to a joint effort by the ICC and the International Bar Association. Both organisations recognised that in addition to a profound gender gap, there needed to be more African attorneys qualified, since all of the cases before the court are from Africa. Mark Ellis, executive director of the IBA, said that the lack of ICC-qualified female lawyers was particularly problematic since sexual and gender-based crimes feature in nearly all of the cases before the ICC. In 2010, the ICC and the IBA launched the “Calling African Female Lawyers” campaign. It involved a series of public events across the continent intended to spread information about qualifying to practice at the ICC and recruiting women to apply for the List of Counsel. Just because there are more women are on the List of Counsel, it doesn’t necessarily mean more women are practicing at the ICC. Uganda typifies the problems in getting more Africans on the List of Counsel. The situation in Uganda was the first investigation opened by the ICC. Nearly a decade later, the first trial is scheduled to begin. In January 2015, Dominc Ongwen, an alleged commander in the Lord’s Resistance Army (LRA), was taken into custody. His will be the first case the Court hears on the situation in Uganda. In 2010, the List of Counsel recognised only 2 lawyers from Uganda, both male. By 2014, that number had doubled to 4, including one female, Eva Luswata Kawuma. She has since been appointed as a judge to the High Court of Uganda, so she can no longer practice at the ICC. Ssali also noted that a number of her female colleagues applied to be qualified by the ICC after the Calling African Female Lawyers campaign, but their names do not appear on the list. “I presume the qualifications might be a bit too high for the ordinary African female lawyer,” she said. *By Ella West in collaboration with IWPR.